I was invited over for dinner and asked to bring a salad. The main course was sweet potato and bean enchiladas. I know how to chop up vegetables and throw them together last minute, buy some dressing and call it a day. 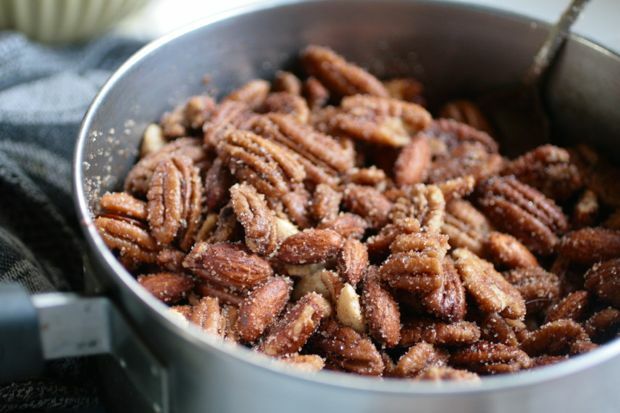 On this particular day, however, I had some extra time and a desire to roast nuts in a sweet and savory mix. I made this mix during Thanksgiving as a way to use all the extra pumpkin seeds I had from several huge pumpkins that were left over from Halloween. My nephews were around for the holiday and munched on the mix and begged me to send them some in the mail. Fast forward to several months and I finally decided I had put it off long enough. I wanted to mail my promise. 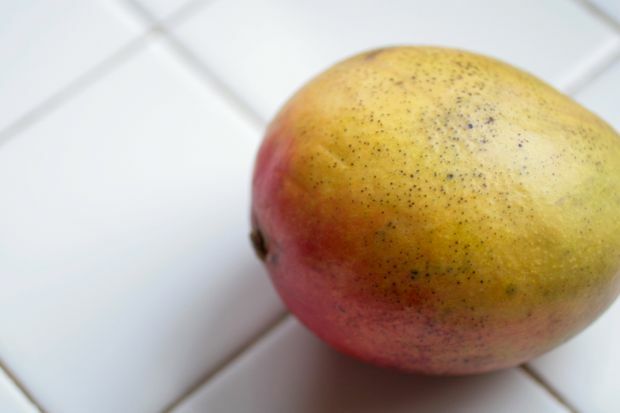 I was thus inspired by the nut mix to make a sweet and spicy mango salad to accompany our dinner. 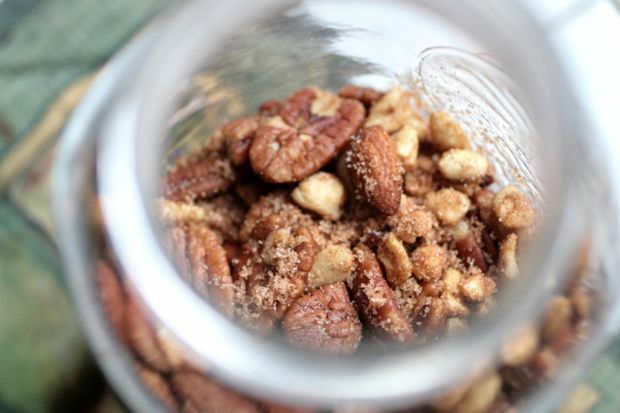 The nut mix takes no time at all and is incredibly delicious. A great way to snack with healthy intentions. The salad is also very quick and keeps well for at least 3 days once mixed (without the dressing). Heat the oven (or toaster oven) to 350°. Spread the nuts on a baking sheet and toast them for 6 minutes or until they are fragrant and their color deepens slightly. In a medium-size bowl, stir together the spice mix. In a saucepan, combine the glaze ingredients and bring them to a boil over medium heat, whisking constantly. Stir in the toasted nuts and continue to stir until all the nuts are shiny and the liquid is gone, about 1 to 2 minutes. 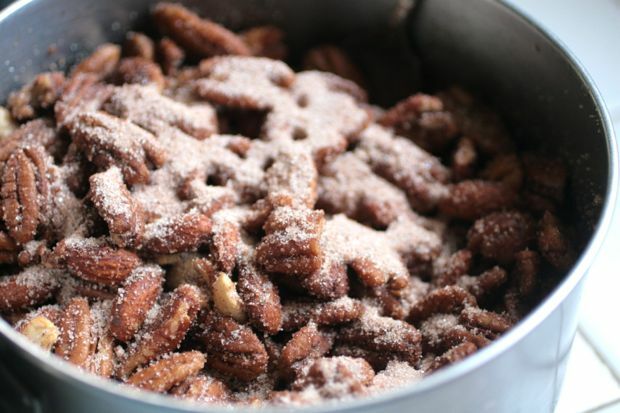 Move the glazed nuts to a mixing bowl, sprinkle on the spice mix, and toss them well to coat. 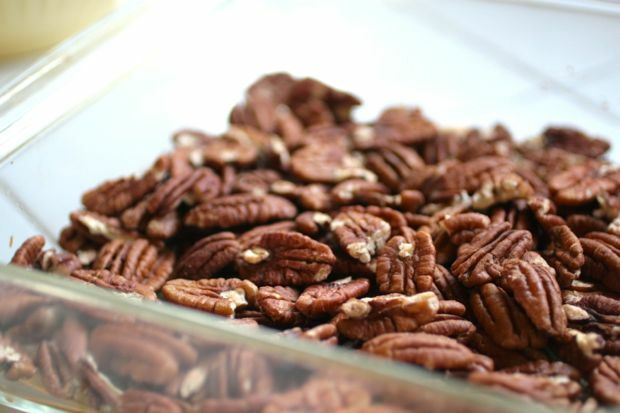 Spread the coated nuts on a cookie sheet and return them to the oven for another 4 minutes; check regularly to make sure they don’t burn. Remove and let cool. Makes 2 cups. Mix together ingredients for dressing in a bottle with a lid. I use old salad dressing bottles. Shake well. Chop 1/2 cup of nuts. 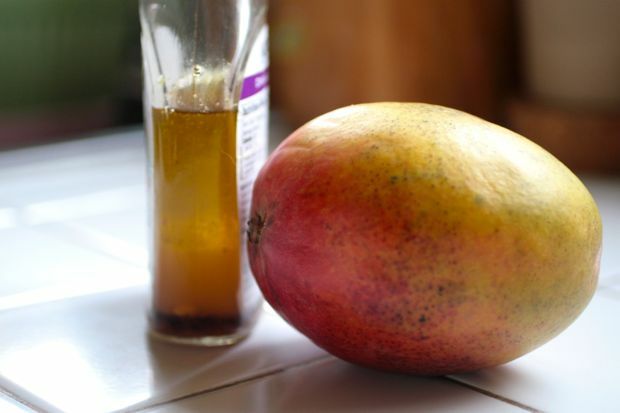 Place greens and mango in large salad bowl. Top with chopped nuts. You can dress the salad in the bowl or allow each person to dress it to their liking. The undressed salad will last longer as left overs in the fridge. I wish I had remembered to take a photo of the final product but alas…I was far to busy consuming it. Enjoy!